Product description Hypoaspis miles (also known as Stratiolaelaps scimitus) is a soil dwelling predatory mites which is supplied in a shaker tube containing 10,000 predators. The mites are packed in a peat & vermiculite carrier with a food source. Hypoaspis miles are mobile enough to be able to source the nutrition and water they require for development meaning that they are able to tolerate periods when the soil moisture levels are low. 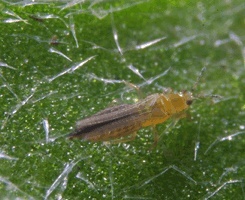 This predator attacks and kills the larvae of sciarid flies and will also consume Thrips larvae that drop to the growing medium to pupate, making it a useful addition to other Western Flower Thrips control products. Incorporate the mites into composts/soils at potting or sprinkle onto the compost surface. The mites will often move up onto plants from the compost looking for prey during the hours of darkness. Rotate the tube several times before opening to mix the contents. Push the cut-out on the lid where marked to open the tube. Rotate the lid cover to the fully open position for application. Shake the tube slowly to dispense the mixture onto the surface of the growing medium. 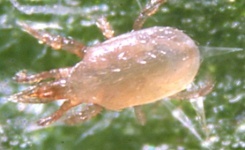 The mites will quickly distribute themselves uniformly through the crop. Use 100 mites per m² before sciarid fly or other soil pest infestation develops. Use 300 mites per m² on existing infestations.